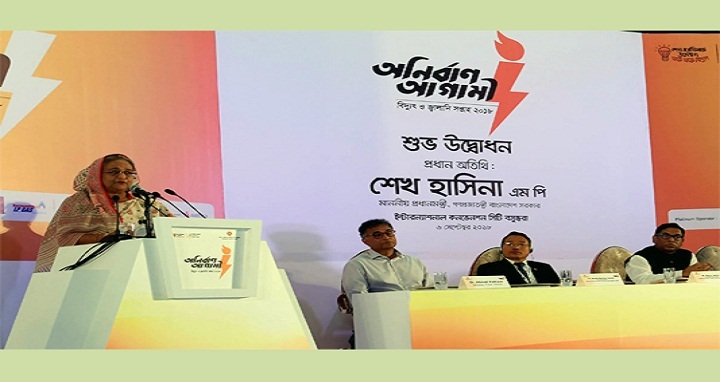 Dhaka, 6 September, Abnews: Prime Minister Sheikh Hasina today said the country’s drawback in power sector during BNP regime was unprecedented, which was not seen any part of the world. The prime minister said with the aim of creating an exploitation-free happy and prosperous society, Father of the Nation Bangabandhu Sheikh Mujibur Rahman confirmed national security through the purchase of five gas fields from the foreign oil company. “In 100 years before 2009, a total of 27 power plants were constructed in the country whereas 101 plants were constructed in last ten years. The government has a plan to generate 60,000 MW electricity by 2041 while 40,000 MW by 2030 and 24,000 MW by 2021,” she said. Noting that distribution lines were also upgraded from 2.6 lakh kilometers to 4.57 lakh kilometers, the premier said in 2009, the number of people having access to electricity was 47 percent, which now increased to 90 percent. She said system loss in power distribution has been reduced to 11.40 percent from 18.45 percent while the government is making relentless efforts to generate electricity from renewable sources to ensure energy security for future generation and address global warming. Before assuming power in 1996, the prime minister said, about 1,200 to 1800 metric tonnes of coal were extracted from country’s lone productive Barapukuria coal mine per day. At present, she said, about 4,000 to 4,500 metric tonnes of high quality bituminous coal is being extracted from the mine using latest technology. Sheikh Hasina said in 2008-09 fiscal, total capacity of oil reservoir was nine lakh tonnes, which increased to 1.2 million tonnes in fiscal 2016-17. Considering the issue of gas reserves in the country, she said, 56 private companies were given licenses to set up LPG plants to meet household demands. To fulfill the growing demand of oil refineries, the prime minister said, the government has taken a project to construct Eastern Refinery Unit-2. Besides, efforts have been made to construct 237 kilometre pipeline of Dhaka and Chittagong aiming to improving the supply of fuel, she said. “The government has taken initiatives to import LNG from abroad to meet the growing demand of the country. Initiatives have been taken to set up ground-based LNG terminal in Piara port, Kutubdia and Maheshkhali. Initiatives have been taken to import LNG from Qatar and Oman and to buy LNG from Spot Market,” she said. After establishing the rights of Bangladesh on 1,18,813 square kilometers of maritime area in the Bay of Bengal, she said, Bangladesh has adopted necessary policies to tap the maritime resources. Due to the continuous expansion of the power sector, the socioeconomic development of the country’s rural areas became possible, the premier said, adding that development of the power sector helped ensure the country’s food security.